Assistant Fire Chief Erik Kalapir's nomination to the Fire Commission was blocked by the Republican majority on the Board of Selectmen in favor of Stratfield Volunteer Fire Department member Joseph Olzacki. Republicans on the Board of Selectmen flexed their political muscles Wednesday, blocking nominations by the Democratic first selectman to both the Police and Fire commissions. First Selectman Michael Tetreau’s nominations to appoint Assistant Fire Chief Erik Kalapir to the Fire Commission and re-appoint Walter Flynn to the Police Commission failed when neither Selectman Laurie McArdle and Selectman Chris Tymniak, both elected to the board last November, would second the motion. Kalapir is a member of the Working Families Party, while Flynn is a Democrat. 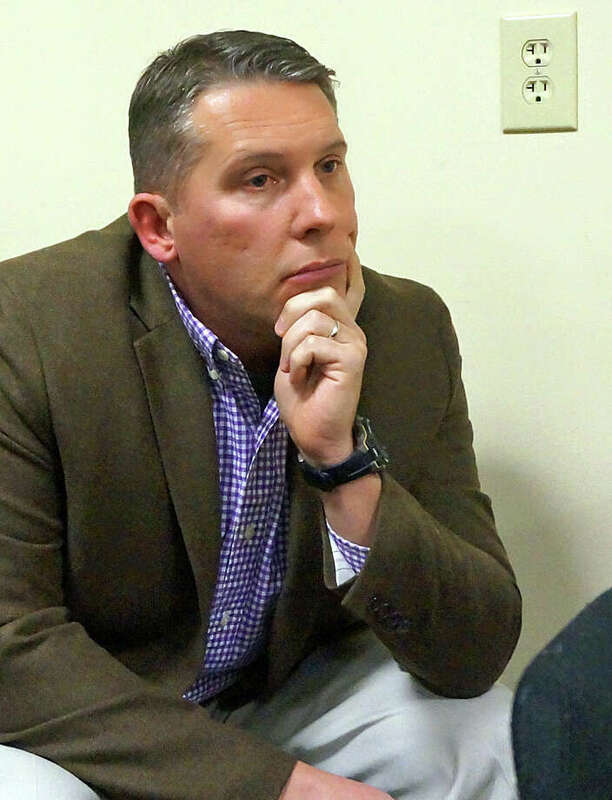 Tymniak instead offered the name of Joe Cafferelli, the father of his first selectman campaign manager, to fill the open seat on the Police Commission. Cafferelli changed his voter registration from Republican to unaffiliated in November, an action which proved to be a sticking point. “One of the important things on the Police Commission is balance,” Tetreau said, noting the panel’s membership for the last four years has been three Democrats, three Republicans and one unaffiliated member. There are now four Republicans, and adding Cafferelli, who just changed his party affiliation, would be limiting the Democrats to two seats, the first selectman said. “The timing (of the registration) switch is a concern,” Tetreau said. “Mr. Cafferelli is an unaffiliated voter here in town,” Tymniak said. “His eligibility should not be in question.” Tymniak said he believes “a lot of people” will be switching their party affiliations this year because of the presidential election. “Mr. Cafferelli will be eligible for appointment,” Lesser said, but will have to wait until next month. Tymniak disagreed with Lesser’s interpretation of the statute, and of the Police Commission as political in nature, but no vote was taken on Cafferelli’s appointment. As for the Fire Commission appointment, Tetreau said it has been several years since a member of the career fire service has had a seat on the board. He said there is currently a member of the Southport Volunteer Fire Department on the commission and he feels it is important for the career members to also have a voice. However, Tymniak and McArdle nominated Joseph Olzacki, a member of the Stratfield Volunteer Fire Department. “I still have my same concerns about the balance of the board,” Tetreau said. Olzacki was approved by a 2-1 party-line vote. Assistant Fire Chief Chris Tracy, president of Firefighters Local 1426, said the union is disappointed by the vote. “Erik has served with distinction on the town Police and Fire Retirement Board for seven years, on occasion chairing that body, and as a trustee helped Fairfield recover pension funds stolen by Bernie Madoff,” Tracy said. McArdle suggested that perhaps there was a way to improve communication between the selectmen so that “people aren’t here and put on the spot.” She said they “need to figure out ways to address things” to save time and be more efficient. Tetreau reminded McArdle that, under the Freedom of Information Act, any meeting of two of the three board members where board business is discussed is considered an official meeting and must be public.